Right up front, I myself am guilty of this. More so that I wanted to admit to myself, and it is very hard thing to eliminate from ones life. The nature of our society makes some materialism both inevitable and necessary. The important thing is to keep it in perspective and to keep your priorities straight. There is no evil inherent in becoming fiscally wealthy through industriousness nor in being fiscally poor inspite of industriousness. All of us must provide for our families to the best of abilities and according to our needs. What we must do to keep our perspective and priorities straight is not to allow wealth to be defined by material things. Love is wealth, Faith is wealth, and children are our greatest wealth. For in the end – how do your accomplishments profit you if you have no family of your own to share them with. What profit is there in acquiring those material things if your wife and children become part of the price you must pay – it would seem a hollow victory to me. I did learn one thing for myself – my happiness is not to be found in material things, but rather in true love both given and received. In truth, my greatest wealth is in the love of my God, my wife, and my children. My greatest accomplishment is the title of Husband she bestowed on me, and the children she blessed us both with. Everything else pales to mere shadows in comparison. It can be a humbling thing when your whole life comes into perspective and you realize what really is important to you, I pray that you will not be at death’s door when you receive this revelation. Do you judge the success or quality of your marriage by the material possessions it accumulates or the position it gains you? Then why would you judge your own success by that measure? Have you stopped to consider how little in this life is truly important. Your body will die – none of us is immune, everything dies. It is a natural (if uncomfortable to talk about) part of our lives. After you are dead – what will you leave behind? Memories and an epitaph on a tombstone. What do you want your tombstone to say? “Successful <Insert your Occupation or Profession Here>” or “loving husband and father”. What memories will you leave behind? Will they be memories of a man that the widow and her children hardly saw because he was always working or travelling in order to be “Successful”. Will you children have more memories of nannies and alternative caregivers than you? What will they remember about you? Being hardworking and industrious is always a good thing – but as is necessary to provide for your family. At some point it becomes greed and vanity. You begin to amass wealth in large quantities, purchase things you don’t need or even want just to make an impression on others. Often people sacrifice the one treasure permitted you on earth that can survive your death – Children. A precious Gift from God that assures even the non-believer a modicum of immortality in knowing that part of them remains alive in each of their children. We are convinced to sacrifice that joy and certitude for hollow material things that will crumble to dust or disuse in mere years. Our wives are often convinced by society that their natural purpose for which they alone are biologically equipped (birthing and nursing our children) is a waste of their time and talents. 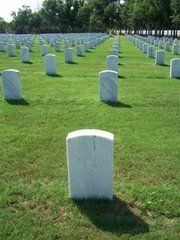 Ask yourself if your wife would prefer “Devoted Wife and Mother” instead of “#1 Accountant 1982-1995” on her tombstone. While I have you thinking about this – ask yourself which is more important to you, a sacramental marriage and children or a successful career. If you chose the career then you have my most earnest prayers. A sacramental marriage requires that you put your wife before yourself in all things – this is a beautiful and noble thing even when done by just one of you, and wonderful beyond all description when it is returned in kind. Children are a gift to each of you from the other, representing the physical embodiment of that sacramental love – they are an investment in the future of all humanity. To a child – an afternoon at the park with their father is worth more than all the tea in China. If you think you are wealthy, ask yourself who will truly mourn your passing? Were you ever truly loved even once in your life and did your bind that love in the Sacrament of Matrimony or let it go in order to finish and education or pursue other things? Did you ever have twinges of regret wondering what could have been? Imagine how unimportant so many of the things we commonly hold dear will be to you at the moment of death. Remember that when you leave this life, you can only take memories and regrets. What harm is there in trying to make a few happy memories -and potentially resolve some regrets ahead of time, after all one can never know the day or the hour when death will come. Ask yourself one final question – Why am I here? If you can’t say that God put you on this Earth to dominate other men, to acquire fleeting material wealth then you might also want to consider some thoughtful prayers requesting guidance from God on the direction of your life. 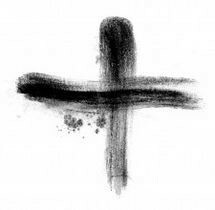 I will be praying for everyone who is discerning their purpose and direction in life this Lenten season. If you have your priorities in order and are happy and at peace then please join me in prayer for others. A thought for the day on marriage…. At first glance it seems like good advice, and it is good advice. But it’s based on an incorrect premise. 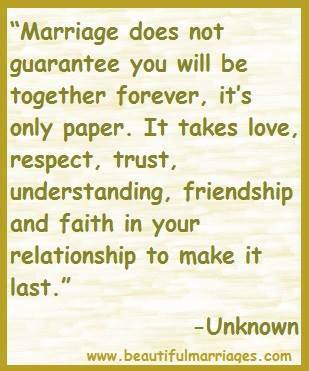 Marriage is not “only paper”. For Catholics, even our wedding rings are blessed sacramental objects. Make no mistake it is a sacrament like Holy Orders – for those whom God calls to married life. A piece of paper is meaningless, but the sacrament of marriage is a consecration before God to a vowed life of defined service no less binding that the vows of a priest, or even the Pope himself. It is not expected to be easy – and the task will be difficult and may be a grinding or joyous as we make it. It is for the sake of not just our own souls, but the souls of our spouse as well as both of our earthly happiness that we make the often extraordinary effort required to make it work. It is up to you to perform your duties with great love and joy independent of other factors. If both you and your spouse do this marriage can be a wonderful sanctuary for both of you. If you do not, then marriage can become a prison of your own making. The choice and the power to transform your approach to your marriage are yours. Can you keep a promise made both to, and before God? For those who have been following the saga of this one brave young girl and her family, I am hoping that reading this and maybe some of the prior posts for the backstory on my blog will help affirm in your hearts the power of prayer not just in our lives but in the lives of others. Kathryn is one of millions of young children who are suffering daily all over the world with life threatening illness. I have long realized that I cannot make a change for all of them directly, but by doing little things with great love for the one(s) God places before me I believe that I can make a difference. I am also hoping I can inspire others to do what they can to make a small difference in the hope that they too will inspire others. The end of which under ideal circumstances is an outpouring of compassion worldwide. I’d like to thank all of you who have prayed, sent cards, notes, letters, and postcards of hope to this young girl. I am posting this update because she still needs your prayers and there is so much more ahead of her than there is behind her. Please keep her in your prayers, and remember that love and compassion are not finite resources – you can give all of each from a neverending supply, replenished by God himself. Last week for Kathryn went well. There were no real changes to report except that her 4 sisters did in fact go through the initial round of genetic testing. The Gardner family wish to send Praises to the heavens on the wings of the Father’s glorious holy angels that from her 4 sisters, they have found one match. Kathyrn’s little sister Karlie(5), is an EXACT MATCH. Praise God!! The test has 15 different markers, Karlie matched all 15 EXACTLY! The family would like to thank all of you for your constant prayers and they ask that you lift Karlie up. They are asking that you specifically ask the Father to prepare her little heart for this procedure should we get to that stage. At this time, the doctors are just telling us that it is highly likely that we will have to get the transplant, so they are going to prepare Kathryn for it. They have not told us when this will happen or told us any details, just that it will probably happen at some point. Prayer Warriors, we have been given great news today for Kathryn and her family. Parents Kyle & Kathy said that on one hand they are ecstatic that they found a match but on the other hand the donor is the youngest and the family is feeling the effects of that reality. In a family meeting today, each of the girls mentioned why she wanted to be the match for their sister. It was very touching. Kathryn is feeling pretty blue these last few days. She is in a real battle and her little body is taking a beating. Join us as we continue to storm heaven with uplifting prayers for her and her family. Remember the family has asked that we pray for 5 yr old Karlie, that God will prepare her heart. Those of us who have the distinct pleasure of knowing this little firecracker, know that she always has the perfect answer for just about anything you ask of her. She is bouncy, full of life and can carry on an intriguing conversation with anyone and anything. A touching and poignant exploration of the erosion of freedom of religion in this country. As Catholics we need to support others who fight the battle of religion vs. progressivism. It is the David and Goliath battle of our time. Years ago, when I was an illustrator collaborating with an author in another city, we travelled to a central meeting place to work. My route passed through beautiful rural areas, going by a small wooden church–Church of Christ the First Born, or something like that, on my way. A tiny church with a few shade trees, a tiny parking lot, out among the fields. What a surprise it was to one day hear about this little congregation on the news. It seems that they believe in faith healing, in the laying on of hands for healing as in Scripture. They trust in God alone, in a most literal and specific way. A couple there brought their sick baby to be prayed over by the elders and congregation. But the baby died. The government authorities were furious and took immediate action.